Lakeshore Family Guide - Free activities and programs for children and families at the Mason County District Libraries in Ludington & Scottville. 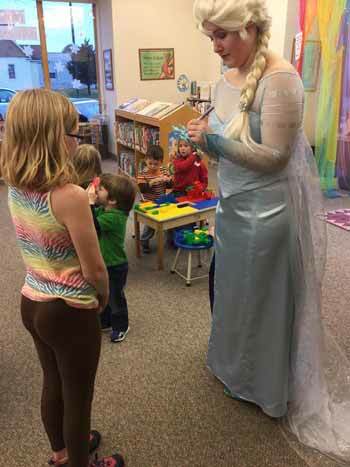 The Ludington and Scottville Branches of the Mason County District Library are dedicated to providing a vast array of educational, fun, free programs to our communities. In addition to regularly scheduled programs, they frequently host special events for both kids and adults. All events at the Mason County District Libraries are free. The Ludington and Scottville Branches of the Mason County District Library have the following fun, free events scheduled in the coming month. Children of all ages are invited to an Earth Day Celebration on Monday, April 22nd at 4pm at both branches. The event includes earth-friendly fun, games, activities, and snacks. Children below the age of 8 must be accompanied by an adult. Young adults in 6th through 12th grades are invited to learn about college applications and student loans on Thursday, April 25th from 6-7pm at the Ludington branch. Babytime: Stories for Babies - Mondays at 10am, Ludington Library. Preschool-K Story Time - Tuesdays, Wednesdays, & Thursdays at 10am, Ludington Library. Fridays at 10am, Scottville Library. Creative Kids: Self-Directed Art, Games and Puzzles - Mondays, Tuesdays, & Fridays from 4-5:30pm; Saturdays from 9:30am-2:30pm, Ludington Library. Mondays, Tuesdays, Thursdays, and Fridays from 4-5:30pm, Scottville Library. Games Galore - Wednesdays from 4-5:30pm, Ludington Library. Fit Club - Wednesdays at 4pm, Scottville Library; Thursdays at 4pm, Ludington Library (Children 7 & older). Block Party with Lego Brand Bricks - Saturdays from 9:30am-2:30pm, Ludington & Scottville Libraries. Teen Games - Monday-Friday, 3:30pm; Saturdays from 12:30-4:30pm, Ludington Library. Monday-Friday, 3:30pm, Scottville Library. Family Fun Craft - First Tuesdays (January 6th-May 5th, September 1st-December 1st) from 3pm-6pm, Scottville Library. Discovery Club - First Wednesdays (November-April) at 4pm, Ludington Library (Grades 2-5). Teen Movie Night - First Thursday of every month, 6pm, Scottville Library (age 12 and up). Every holiday brings a special celebration to the libraries. There are parties for Valentine's Day, Mardi Gras, Easter, Earth Day, Halloween, and Christmas...always fun and always free! 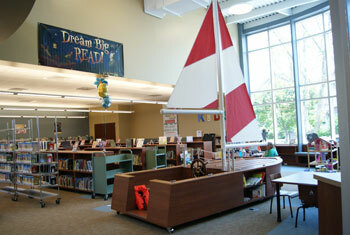 The Mason County District Libraries Aren't Just for Kids! The Ludington and Scottville branches of the Mason County District Library also host recurrent programs for adults. Adult Craft Night - 1st Tuesday of the month (January 6th-May 5th, September 1st-December 1st) at 6 pm, Ludington Library. Digital Downloads - Wednesdays from 5-8pm, Scottville Library; and Saturdays from 12-5pm, Ludington Library. Summers are so much fun at the Mason County District Libraries, the kids may not want to go to the beach! The Summer Reading Program is for kids of all ages, with Read to Me for kids up to eight years, Independent Readers for those 5-13 years, and Teen Readers for 11-18 years. Incentives include book bags, local merchant gift certificates, books, and small toys. Just 20 minutes of reading a day! During the summer months there are also weekly crafts for kids ages six years and older, Science Camps in July and many special programs as well as the ongoing weekly programs. Preschool/Kindergarten Story Time - Tuesdays, Wednesdays, and Thursdays at 10 am, Ludington Library. Fridays at 10am, Scottville Library. Creative Kids: Self-directed Art, Games and Puzzles - Mondays from 2-4pm; Tuesdays, Thursdays, & Fridays from 1pm-4pm; Saturdays from 9:30am-2:30pm, Ludington Library. Tuesdays & Thursdays from 1-4pm at Scottville Library. Fit Club - Wednesdays & Thursdays from 12:30-3:30pm, Ludington Library. Tuesdays at 4pm, Scottville Library (Children 7 and older). Block Party - Create with Legos. Saturdays from 9:30am-2pm, Ludington & Scottville Libraries. Quidditch - Fridays at 4pm beginning June 22nd, Ludington Library. Four years of fundraising and seven months of construction has produced the beautiful new children's wing to the Mason County Library in Ludington. The Keith Wilson Children's Center was formally dedicated on May 18, 2012. The new wing adds over 5,300 square feet to the library, which now offers a Story Time and Sailboat Play Area, West Shore Bank Multi-Purpose Room and Craig R. Rasmussen Outdoor Activity Area which is enclosed by a fence. 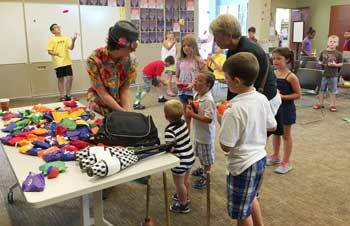 Children simply love the Mason County District libraries in Ludington and Scottville. They're kid-friendly, and have activities all year for children of all ages. The mission of the library is children's literacy...encouraging children to read by making it fun and enjoyable. Their theme is "Just Imagine," allowing kids to engage their minds and curiosity of the world around them. The Mason County District Library is so much more than books...it's a fun place for kids to learn and explore, while increasing children's literacy.